In this post I show how the well-known ‘Business model canvas’ can be represented very effectively using a concept map. I also argue that in many cases the design of a business model should be preceded by the design of a systemic intervention using the systems approach. The entire process from wicked problem to business plan then becomes: WP→SI→BM→BP, where WP = wicked problem, SI = systemic intervention, BM = business model, and BP = business plan. Alexander Osterwalder … writes in his PhD thesis (2004) that the complex term “business model” rose to prominence in the dotcom years before the well-known bubble with the same name burst in 2000. At the start of his thesis work he was mainly interested in the development of effective software-based business model tools to improve strategic management in a rapidly moving, complex and uncertain business environment. Because the bubble had burst shortly after, he quickly weakened the research question to: “How can business models be described and represented in order to build the foundation for subsequent concepts and tools.” So, essentially, his PhD thesis became an exercise in knowledge modelling. One of the things he found during his research was a strong interest of the business community in business models to enhance communication and transparency. Several years later, Osterwalder came up with his now famous business model canvas. A very short introduction can be seen in this 3-minute video. Business model generation … is the title of a book, written by Osterwalder, which I heard of in early 2013. I picked up a copy last week and, flipping through, it occurred to me that the business model canvas could be made a lot more readily understandable by turning it into a concept map (concept mapping is a knowledge modelling tool). The key concepts of the canvas are depicted in yellow, and the meanings of these concepts are illustrated in grey. I rather liked the result, so I figured I should share it with you. The book (i.e. ‘Business model generation’) provides lots of ideas and additional concepts. I particularly liked the grey ‘Outlook’ section in the back where non-profit (social) business models are discussed, e.g. the Grameenphone model. There is also a section on how to write a business plan based on a business model (pp. 268-269) and one on the implementation of the business model (→plan→implementation) in an existing organization (pp. 270-271) with ‘levers’ for effecting change in the areas of strategy, structure, processes, rewards and people (these areas in fact correspond to Galbraith’s Star Model of organizational design). Sequoia Capital … (an American venture capital firm) provides an alternative, 10-step model for writing a business plan, which you may like as well. Steps 2 and 3 focus explicitly on the problem (the pain of the customer) and the solution (your company’s value proposition to make the customer’s life better). In Osterwalder’s model these two key aspects are combined in the ‘value proposition’ concept. 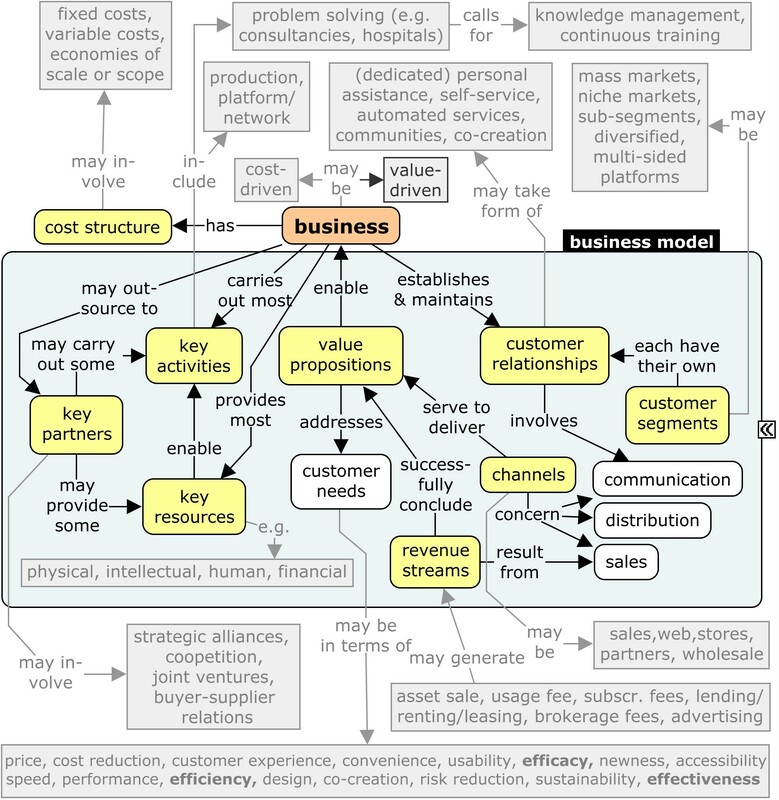 At another level the distinction is made between a cost-driven and a more value-driven business (see concept map). Value-driven businesses are generally the more interesting ones, although the distinction between cost-driven and value-driven businesses is not always easy to make. The systems approach What troubles me in the models of Osterwalder and Sequoia is that they seem to leave out the step preceding model design. This is particularly the case for value-driven enterprise development to address complex, wicked problems. In such cases, it seems to me that the systems approach would appear to be a good choice to find ‘whole system’-based ideas for designing systemic interventions for innovative business models, which in turn could be described in the form of a business plan. The systems approach typically deals with aspects of design, co-creation, risk reduction, sustainability – a huge challenge for business – and effectiveness – a huge challenge for government – (look in the concept map in the grey box illustrating the various types of customer needs). 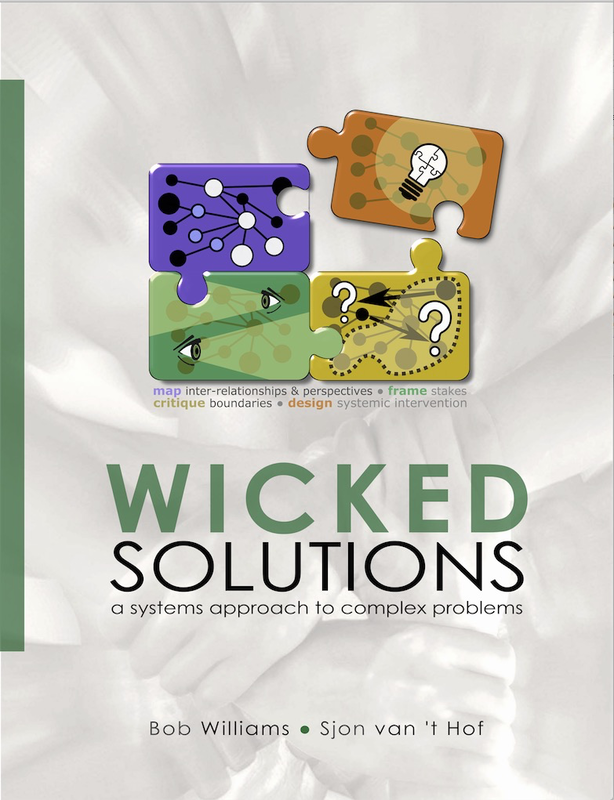 I am not saying that it is always wise to consider everything as a wicked problem, but wicked problems are more widespread than we like to think and people often want to get rid of them or find some form of alleviation from them, so it may well be worth keeping the systems approach in the back of one´s mind. If not for thinking of new businesses, then perhaps for imagining more innovative business models.